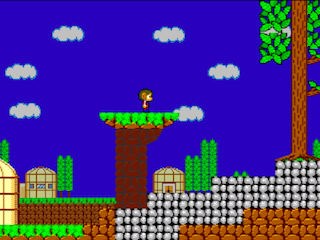 This to say, that is now very easy for me to build a game level, and get it running with my Engine. As you will see below, I prepared a small demo using existing TMX files, and It just took me less than 1 hour to get it running in a browser, great no ? I haven't yet done any bench on what my engine is actually capable of, I keep this for when I'll find an idea about my next project, but I'll keep you posted. You can click on the picture or here to launch the demo. I'm also very interested by your comments if you have any suggestions. And of course, don't try this with IE6, you'll need a recent browser HTML5 compliant (Safari 5, Chrome 9, Opera 11, ...). I'm developing a Tiled plugin to allow save and load maps in JSON format, wich i think will be better to parse. Already got exporting working, developing reading. So yes please let me know, and check www.melonjs.org and my last blog entry, since this post, I had some nice work done on my library. I am really really glad seeing you using TROAK content in your demo. Nice job dude! Hi friends, This is Victoria from Chennai. I am a technology freak. I have read your blog. It was really a wonderful article and I was really impressed by reading this blog. Thanks for sharing this informative blog. I did HTML5 Training in Chennai at FITA academy, Its really useful for me to make a bright future. If you look here you will find some high quality essay writing tips that you need to totally check out as soon as possible.